Only three windows in our cabin could be considered to be "finished" - in that they have frames completely around them. The two large upper windows in the main area, where Papa framed them in a year ago, and the bathroom, which, incidentally, Papa framed in two years ago. Makes me feel very guilty just typing that. I've got a few experimental ideas for framing in the remaining windows, but for now I'll keep them to myself until I have a chance to try them out in practice once the weather warms up. In the meantime, I have been covering up the windows with the clear film that is so common in these parts when the weather turns exceptionally cold and people start to notice frost appearing. This film is far from clear, especially since I have very limited success getting it to stick completely, and even less success trying to use a hot air dryer on it to make it shrink tight and smooth. Interestingly, the two large patio doors, once sealed up with this film, tend to billow inwards to a significant degree, indicating that there is a large loss of hot air from elsewhere (higher up?) in the cabin. I will have to begin investigating this also when the weather gives me greater leeway to work outdoors. I have a significant plan for another area of the cabin that may go a long way towards dealing with this possibility. 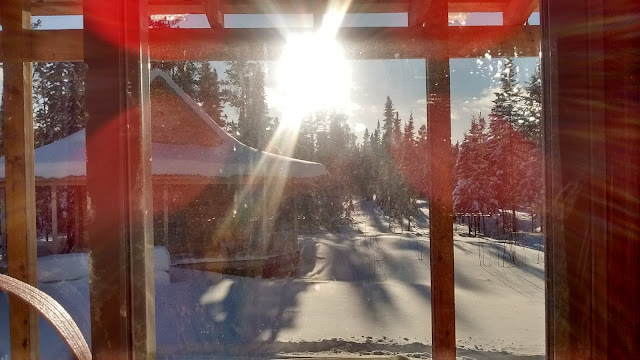 In any case, with the bathroom window being the smallest window in the cabin (tied for that honour with the pantry window), I decided it would be a good candidate for my first "storm window" experiment. In this case, I have decided to put up a piece of acrylic that could cover the entire surface of the window. A quick call to Surecraft and a few days later I had a piece in my hands sized to cover the opening, plus about 3/8" on both sides and top and bottom. I had already worked hard to clean off any residue from the previous temporary plastics. Protective layer removed, ready to install. Looks clear! I put a fine bead of "Draught Attack" caulking on the acrylic, and then took it into the bathroom and pushed it against the window. I smoothed out the caulk around the edges - it didn't have to look perfect, just not horrible. Anything would be a step up from the disposable stuff. Ready to test out this stuff. Very hopeful! After holding it a few moments, it seemed to stay up on its own. I went to get the camera, and when I returned it had already slid down about a half inch. I pushed it back up and tried to affix the top edge with some painter's tape. Nearly slid off the top edge! The tape! It does nothing! Returning about fifteen minutes later, it was once again sliding down too far to work, so I pushed it back up and wedged a knick-knack under it for the remainder of the day and to the next morning. It now seems properly affixed. Inside the edge of the upper pane, I put a desiccant bag to help keep out any condensation. I usually put a small thimble with dry rice in the frames of my windows for just this reason, but I had some silica from electronics items, so I thought I'd give it a go. Tiny silica bag to help alleviate fogging. So far it seems to work as expected. I don't feel any breeze, and it's much clearer to look through. I will have to see how well the "Draught Attack" peels off in the spring, and then figure out a good system and place for storing the acrylic sheets. 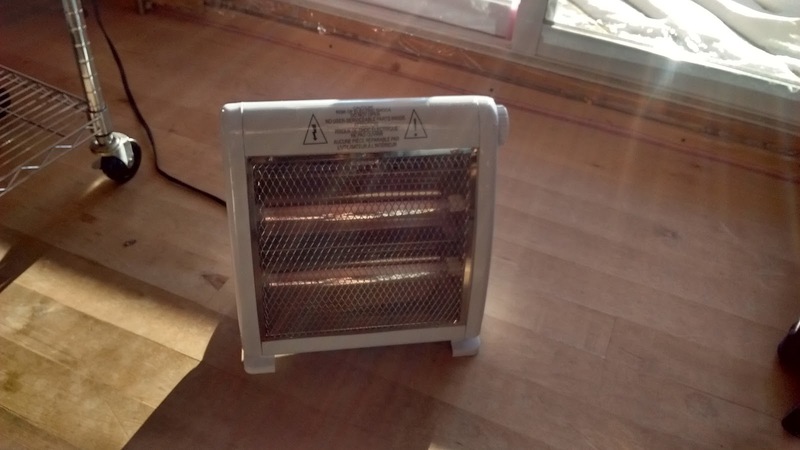 I think it will work well, but it may need to be adapted for some of the larger windows, or especially the patio doors. I'll try to give follow-up in the spring when it comes time to remove the panel. With the surplus power I have been getting on days like today, I felt like it was a good chance to push my luck and try out our popcorn popper. It has been used a couple of times a week here on the woodstove, but the whole reason I special ordered one that was suppose to be induction compatible was so that in the summer we could still enjoy our snacky treat without having to fire up the butane or wood stove. First I assembled our popcorn staples - popcorn (usually from Bulk Zone... Either white or mushroom), peanut oil (it doesn't seem to burn as quickly, and we all love us some peanuts), the induction cooker, and the popcorn popping pot. Everything ready to go. So excited! And a close up of just the ingredients? I put in enough oil to coat the bottom of the pot, as well as about five kernels. Then I put it on the cooker and started it up. Test kernels installed. Waiting for it to warm up sufficiently. I like the reflection of the photographer here! The default setting of the cooker is 1000 watts or 150 degrees Celsius. I let it ride at 150 degrees and then tried to look up the best temperature to use. Within a few moments, I heard the kernels popping! I was shocked - shocked I tell you! I poured in about a quarter cup of unpopped corn and started cranking the handle. It popped amazingly rapidly - I would say it was as fast as a bag of microwave popcorn! I quickly emptied it into a nearby bowl, and in fast succession, popped two more bowls. Kenny scrambled to get the first bowl out for me. You see, it seems we all have different preferences for what we put on our popcorn. I like popcorn salt, Kenny likes plain salt, and Donna right now is rocking the white cheddar seasoning. So I usually make three small batches and we each have our own. I repackaged mine in the bag to eat later. I'm super pleased with the setup - it worked fast and easy! I even boiled water right in the popper afterwards and was able to clean it up in a snap! A Leaky Chimney? Or Condensation? Last year, before we installed the ceiling, we noticed a few times where water would occasionally seem to drip in behind the stove from somewhere near the stovepipe. I thought that perhaps it was condensation forming up in the chimney cone and running back down. I hoped that it would be cured by finishing the ceiling and packing the cone with insulation. As usual, reality wasn't in my favour. We've been having a bit of a warm spell lately, and the snow on the roof is actually melting off rapidly. I happened to glance up at the top of the inside stove pipe the other day, and noticed that one of the boards alongside it was fairly water stained. Closer examination showed it to actually drip once or twice. Hmmm, that doesn't look like it has always been like that. I sighed, and then took the family out for a snowshoe walk through the ravine to try to clear my head. When I returned, I headed up into the attic and found a slow drip, drip onto the Roxul stone wool packed up there. I simply added a large can to catch the drips, and I assume that there must be a slight leak around the cone somewhere. Looks fine from back here. Oh wait, there's some water there. Oh, and some obvious water dripping off the insulation. Rats. When my brother comes to visit, I'll try to convince him to go up with the caulking gun and do some touchup in exchange for A (i.e. one) beer. In the meantime, things look dry again, especially in light of the fact that all the snow around the chimney has disappeared. Just thought I'd throw up a couple of pictures and a blurb about our solar power system this afternoon. I ran the generator this morning as it called for flurries off and on today, but around lunch the sun came out and the skies cleared, so I shut it off and gave the panels a really thorough sweeping. Right now you can see that the batteries are in absorption. 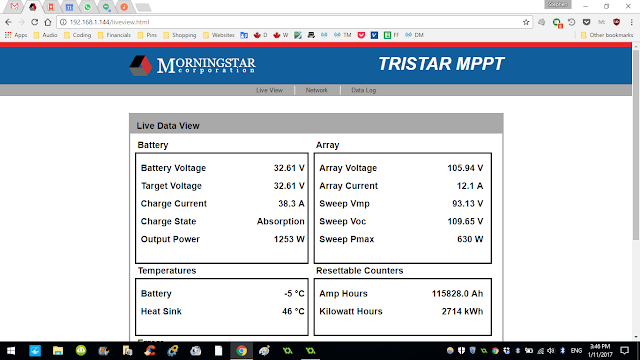 Pulling down close to 1200 watts! 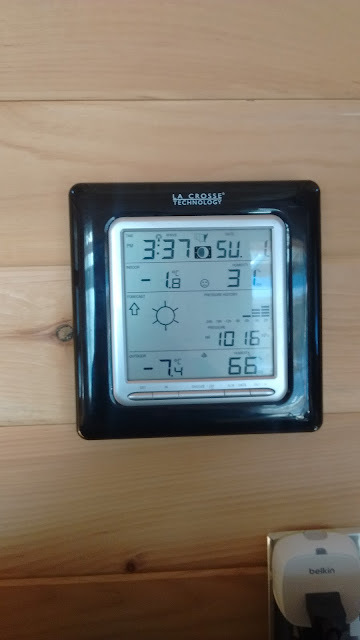 And on the wall, you can see that the temperature has come up from 17.7 around lunch, to (as I type this) 19.4. Chilly outside, but not bad inside. 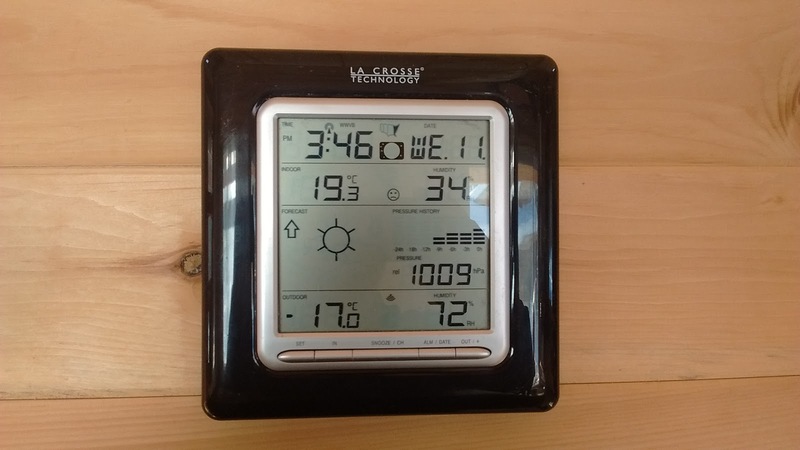 I don't know if I can attribute that to the sun outside (where it's -17.1 in the shade), or to the space heater that I plugged in and is running in spite of the fridge, internet and laptops all drawing juice. I'm pretty happy about this! It's like money and heat in the bank! Bright sun, but still pretty low in the sky. I originally put in accesses to the crawlspace. Two doors in the pantry (so we could lower food into that space and use it as a cold storage), and one at the bottom of the stairs (where I had originally envisioned putting in our solar batteries, but then lost my nerve at the notion of explosive gasses accumulating while charging). Now that I'm no longer storing batteries indoors, I have finally realized just how much cold air was leaking out around the edges of the door. I decided that sealing it up would be the best option. I assembled a piece of plywood that would more than cover the hole underneath, a length of two by four to create a new "joist" to attach the lid of the access to so that it would be extra firm, some spray foam and stone wool insulation. First of all I measured and cut and installed the joist. It's an older joist, but it checks out. I put the plywood down below, hopped into the crawlspace, and screwed the plywood to the bottom of the access. I came up in the pantry, dusted off and then returned to the bottom of the stairs. I reinstalled my joist, and then used my spray foam around the edge of the plywood. Unfortunately my foam ran out surprisingly quickly. So I asked Donna to bring me more as she was in the city with Kenny at the Countdown Escape Room. A disappointingly small amount of foam from the first can. Still, I can install the joist while waiting. When she returned, I filled in more foam under the outside edge. This looks a bit better. Can you believe I thought I'd fill the whole space?! Then I added the stone wool. This should help to keep things a bit less draughty and cold! Finally I put the lid back on, and countersunk several screws into it to hold it firmly down. No more draughts! Eventually I plan on laying a new floor on top of everything, so that should cover up any cosmetic issues. It appears that nylon hose seems to fog up or get clogged up over time when you have water as hard as ours is. You can see where the water reaches quite easily. I've come to accept that it's a "consumable" now, so with my latest replacement of the hose, I decided to try to make it easier in future by adding a threaded connector to it. You can see the single drop of water here. Should have added tape to that connection. I also used the included tape on the LED light strip to mount it to the wall behind the hose. Looks so awesome! A lightsabre! Now with the new setup, I only need about four and a half feet of hose each time I replace it. As I can buy it in ten foot lengths, that means I can get two lengths out of it with very little waste. This is a nice thing. I didn't use teflon tape on the threaded connector here - It drips VERY slowly, so I'll add that in the next day or two. I wonder if even a bit of peanut oil on the threads would be sufficient. So we've had a fairly traditional washing machine for almost a year now. It has been working quite well for us. We can do a very full load on about a full tank of water here in the cabin, for both a wash and a single rinse. Shortly before Christmas we ran out of our soap nuts detergent. For a week or so I resorted to using "all purpose cleanser" - but I doubt if that's really an appropriate appropriation of their description. While at my parent's house though, I overheard my sister say something about how she was all in with baking soda and vinegar for her laundry. I consulted Google slightly and thought I'd give it a try for our cleaning needs. I knew that mixing the soda and vinegar would neutralize both, so I decided that the soda should be for washing, and the vinegar for rinsing if desired. I can say that it seems to work pretty good. I suspect that as with many cleaning rituals we are involved in, it's mostly the agitation and water that does the work, but adding something else still feels "right". So there we are. And a chance to really make use of the detergent cup! But I get ahead of myself - the first load I attempted to do in the washer, as soon as I turned on the water, I could feel it spraying out at me from behind the machine. I turned off the shutoff tap and retightened the hoses. Again, as soon as I turned on the shutoff tap water was spitting at me. Close examination revealed that it was the tap itself leaking - and not at any fitting - directly through the side of the brass! It seems that when I drained the water lines, the valve on the washing machine was shut, and held an "air lock", preventing THAT line from draining. When the cabin froze, the tap didn't have any give the way my plastic plumbing does, and so it cracked. Thankfully, it didn't leak, just as long as we didn't turn it on. I did that particular load of laundry the old fashioned way - buckets filled at the sink and poured into the top of the washing machine. 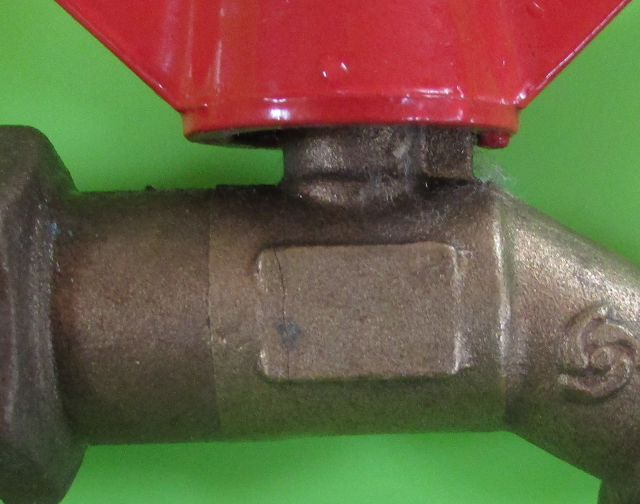 I promptly purchased a new valve - this time with a lever handle and ball joint rather than the original tap. I don't see that there is a big difference - I just have to remember next year to remove the hose from the washing machine after I drain the water lines to allow the water to drain out of that section too. Draining the water from the line correctly for once. Oh wait, there, on the left side of the rectangle, NOW I see it. Looks just fine right here. All hooked up and insulated again. With everything hooked back up, I left the washing machine out from the wall for the next load so we could monitor it. I'm pleased to say that everything went just fine this time around, and we're now back in business! After a lovely time with my parents in Waterloo, we returned from Christmas holidays to the cabin on New Year's Day. Grandpa had started a fire in the morning, but it had long since gone out by the time I arrived. Only 7 below isn't bad either. It's currently about -27 as I type this! I promptly started a fire and was able to have the cabin inhabitable by that night - although as always, it cooled off quickly again overnight, but after a day I believe we had it mostly warmed up. There were a couple of nice blessings. Grandpa had shovelled or swept off the bottom few solar panels while we were gone - when I arrived on a sunny day, the top panels had cleared themselves as well, so we were getting decent production. I had fully charged the batteries the day we left, and so they were still full as I had shut off the power while we were gone. That was nice. After reinstalling the whole house filter, water pumped immediately! The well hadn't frozen in a week of disuse! I can't really know whether to attribute this to the bubbler I had installed in the fall, or if there was enough snow on the wellhead to insulate it appropriately. Either way, that was a tremendous boon! Interestingly enough, the water line between the bathroom and the kitchen must have a dip in it that collects water, as the bathroom sink didn't run water for two days. I guess it took that long to thaw the water line down in the floor. Something to keep in mind I guess. Now that Kenny's birthday activities have finished up, it's time to get settled in to the remainder of winter. At least the days are getting longer and longer, and the consistently grey skies should be behind us for the most part. I've been running both generators much more than in the past, and that's also helped to keep us more comfortable. 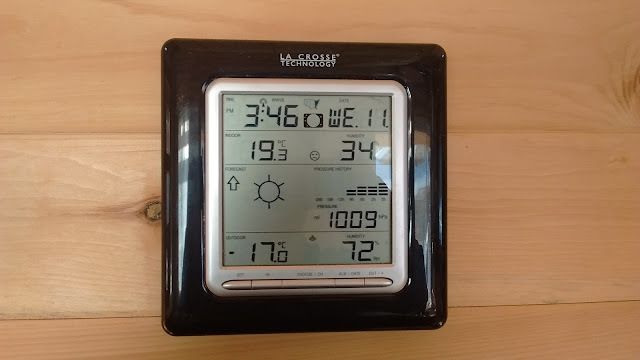 I've even been able to run our tiny space heater on low on a particularly sunny day when the batteries were already mostly charged.